For the prime-time Broncos versus Chiefs game this evening, the kickoff temperature will be about 25° with a wind chill of 13°. Winds will be out of the north with gusts to 23 mph. 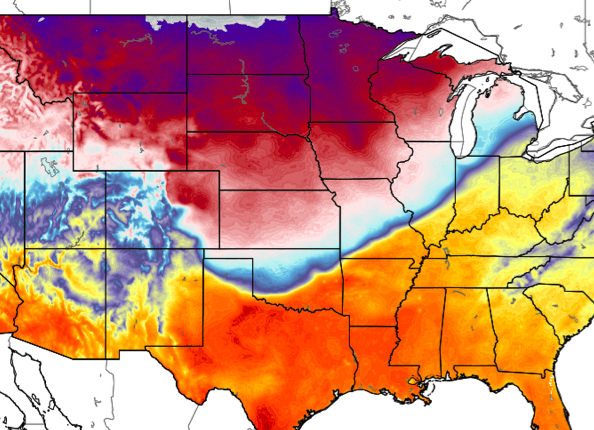 …so that you are on the southeast side of the cold front. Given the temperature drops more than 20° in a few miles, your Thanksgiving return travel would be more pleasant if you stop before you get to the cold front. San Francisco, 2 hr. 49 min. Hope you and your family had a great Thanksgiving. We certainly did. ADDITION: 3:42pm. Here is what I mean. I you are traveling on I-35 you may want to fill up in Ardmore, Okla., where it is 77° versus Norman (~ 30 mi. away) where it is 50° with a strong north wind. In the OKC metro area, temperatures are in the mid- to upper 40s. Here is the rainfall from the last 24 hours. 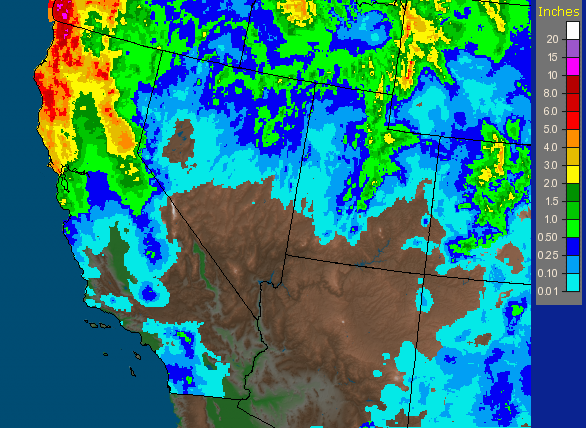 And, here is the rainfall the last two weeks. Keep in mind that much of Southern California's water comes from reservoirs in Northern California. So, these rains are even helping Los Angeles. More generous rains are forecast for the nest seven days. On Monday night or Tuesday, we will have information from the National Weather Service that will indicate the extent to which the rainfall through Saturday morning has helped the drought. My sense is that, by the time December 15 rolls around, roughly half of the needed rail to break the drought will have fallen. Keep your fingers crossed. There should be no problems prior to sunset this evening. However, late tonight and Monday some light freezing rain or freezing mist may occur in these areas. 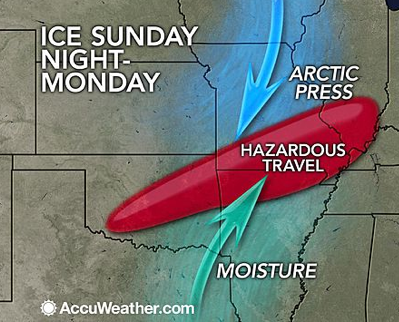 The highest probabilities will be in the Ozarks. 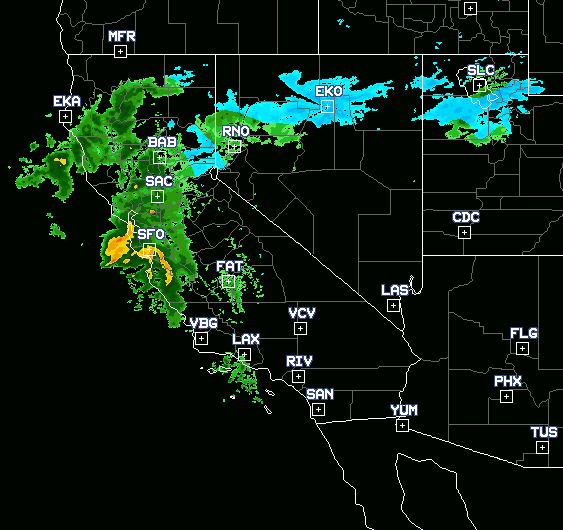 Here is the latest AccuWeather regional radar at 7:45am PST. The heavy rains around the Bay Area are causing average delays at SFO of 1 hour, 51 minutes. More rain will be spreading across the state today. 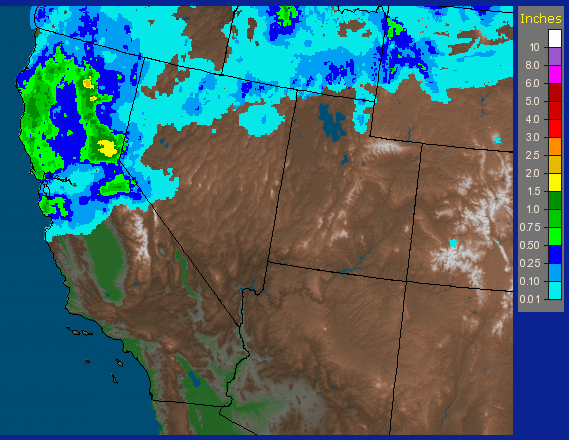 Later today on the blog, we will have more information on the status of the California rain. My gosh, how many of these stories are going to be written this month? This one accuses meteorologists of lying in their forecasts. I can't speak for The Weather Channel, but I can tell you that AccuWeather, our founder Dr. Joel Myers, and every employee of the company is passionate about providing the most accurate forecast possible. We spend a tremendous amount of money (i.e., purchasing the output of the European model) to achieve that goal. Never once -- not once -- in the eight years I have been part of AccuWeather has anyone ever suggested hyping a weather situation. This blog and Mike Smith Enterprises is also dedicated to providing the most accurate science and information possible without regard to politics or other considerations. And, New York's Governor Cuomo can't seem to get his story straight. At first, he lied (yes, lied) about the Buffalo office of the National Weather Service not forecasting the blizzard. They did and they did a great job. Then, he apologized sort of. Now, he is back to saying New York needs it own weather service because the NWS's forecasts were somehow inadequate. Let me see if I can piece together what is really going on. The governor seems to want a "mesonetwork" which is a state-run set of weather stations that supplements the federal network. Oklahoma was the first state to have one. Below is a map of the locations of their mesonetwork stations with temperatures posted (3pm Saturday afternoon). 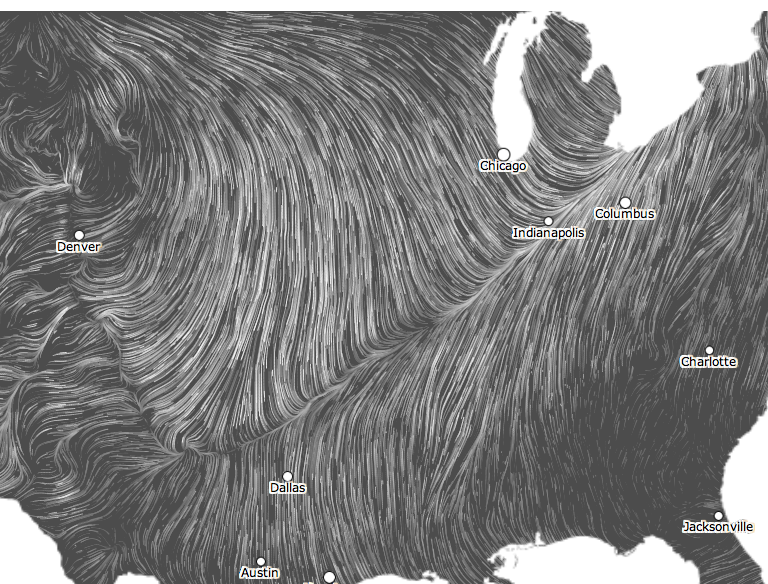 Add the federal stations and one has a useful, dense network of meteorological sensors. 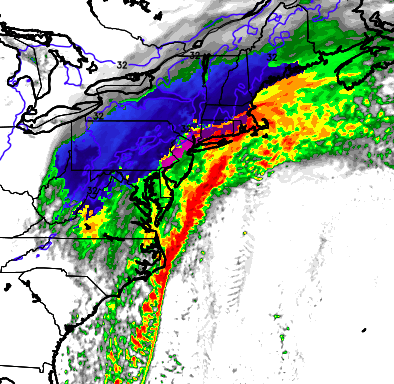 I believe well-mainted mesonetworks can provide data that leads to more accurate forecasts. However, weather stations do not make forecasts. That requires people, computers, computer models, etc., etc. It appears Gov. Cuomo wants to also create a state-run meteorological service. That would be a complete waste of money. If the governor feels he needs services over and above those provided by the National Weather Service, AccuWeather would be a superb choice and it would be far less expensive for taxpayers than starting their own service. And, yes, AccuWeather did an absolutely superb job with the Buffalo blizzard. I'm pleased to report we have received gratifying feedback from a large number of Upstate New York clients. One thing we know in meteorology: You can't teach experience. AccuWeather has been around for more than a half-century with many meteorologists with decades of experience. NY state-run weather service: Wasteful idea. Temperatures have dropped 50° in Montana today compared with yesterday. 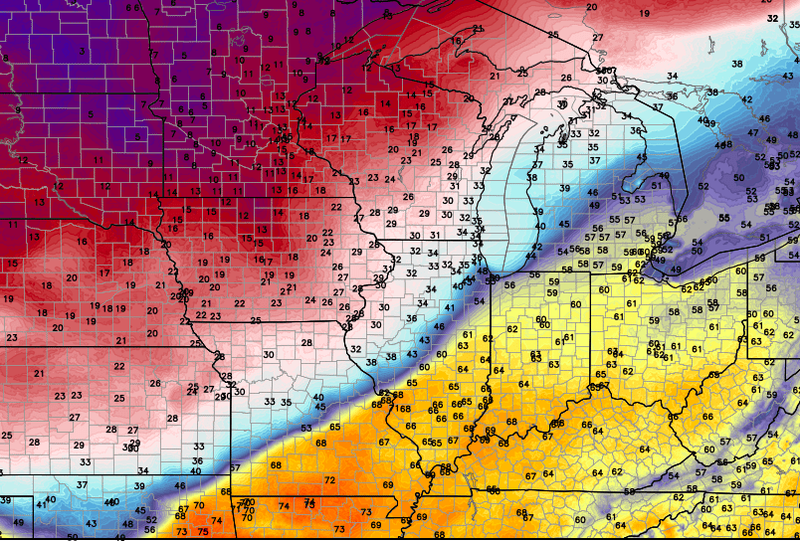 While people are watching the Kansas State-Kansas game with 70° temperatures, don't be fooled. When the Kansas City Chiefs play Denver in KC tomorrow night, the temperature will be 28° with an AccuWeather Real Feel® temperature of 15°! An entirely new approach to "switching off" chronic pain. 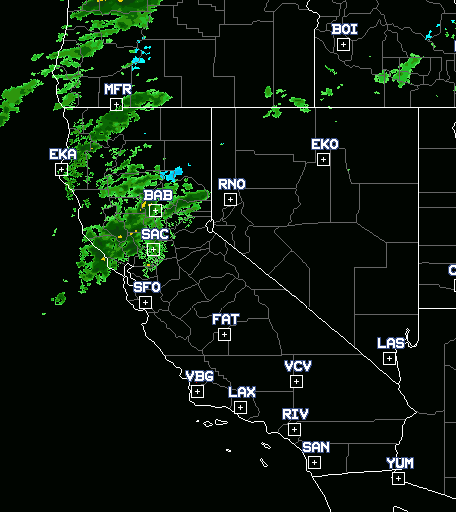 Here is the current radar which shows rain spreading across California north of I-80. The National Weather Service is forecasting additional precipitation as much as 9 inches over the next seven days. 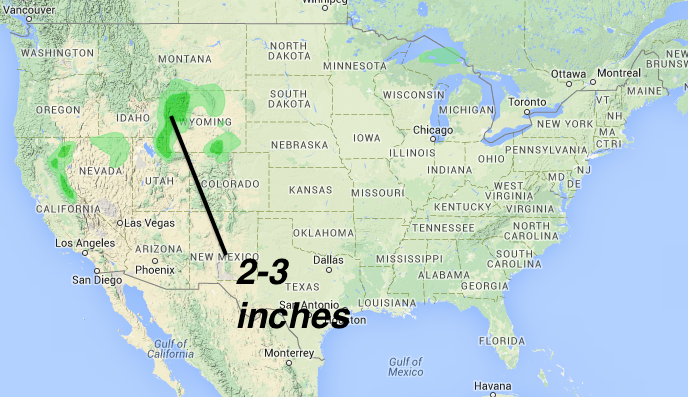 The hills around San Francisco Bay are forecast to receive as much as 5.8 inches. 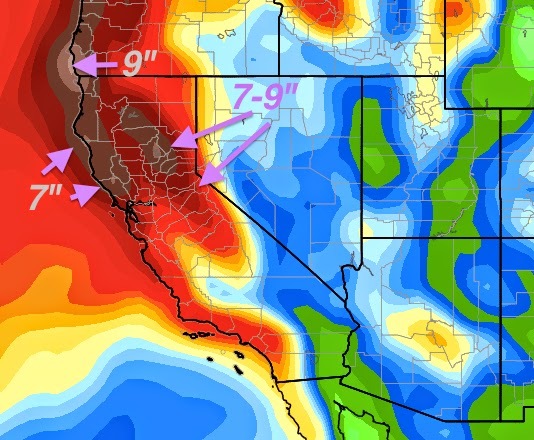 The long range forecast models show additional rains falling in California on days 8-10. This will not break the drought but it will dent it if these forecasts are correct. 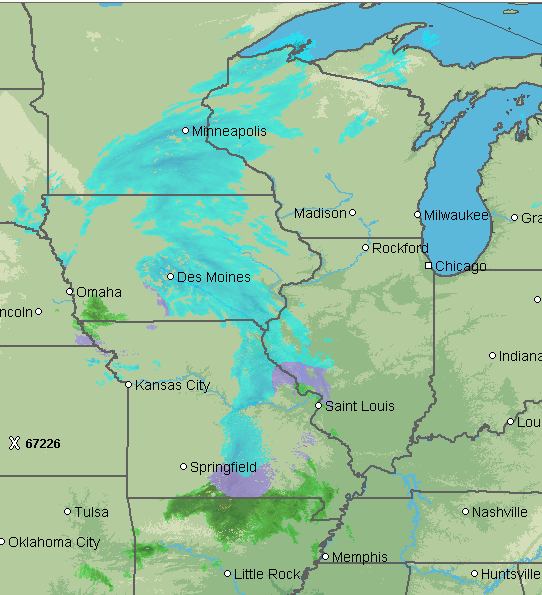 The darker green is 2-3 inches of snow during the 24 hours from 12:01am to 11:59pm CST Sunday. Lighter green is less than two inches. I-80 in southeast Wyoming and over the Sierra could have some slick spots but no major problems are expected anywhere in the U.S.
Below is the weather map for 11:59pm Sunday night. 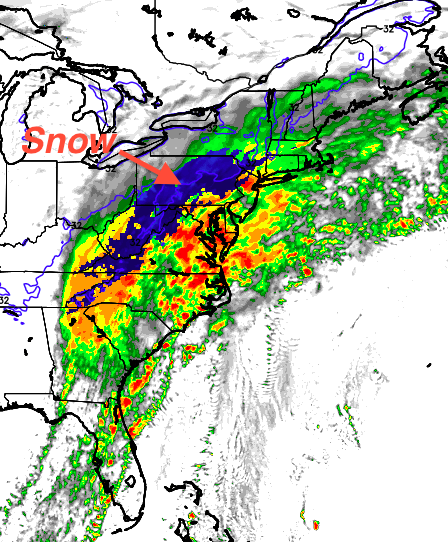 The tinted areas are precipitation with the darker colors indicating heavier amounts during previous 24 hours. …say the critics and readers. It makes a great gift but Amazon (at this moment) is down to nine copies. Also available at Barnes & Noble and your local book seller!! I guess I should tell my tale of woe regarding the last solar eclipse I attempted to see. Notice the word, "attempted." In 1991, I took my entire family to Hawaii to see a total solar eclipse. The kids had never been to Hawaii and I thought it would be a great family trip. The area of longest totality was between the islands of Maui and Hawaii. So, I booked the family on an eclipse cruise. The weather was fine when the ship left the dock. But, it poured down rain during the eclipse and the family was terribly disappointed, especially since they had to get up a 4am. 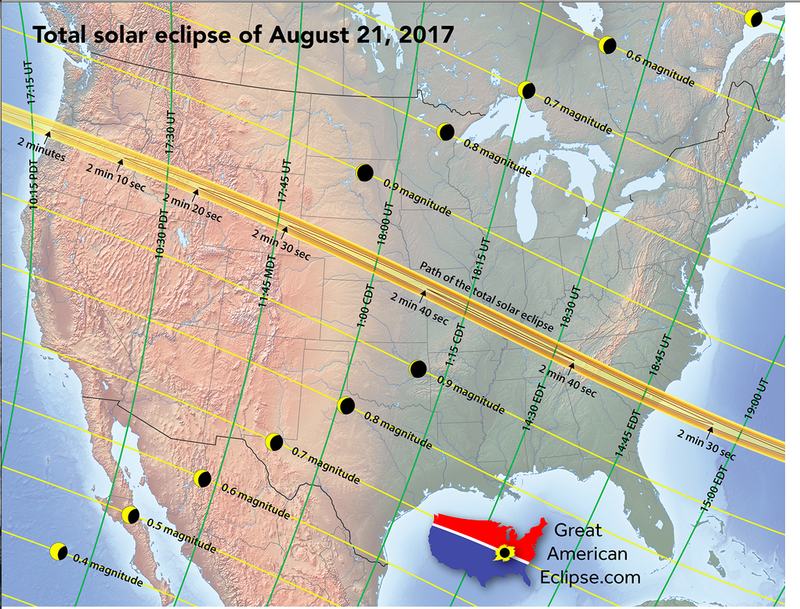 All they could see at the time of totality was clouds, rain, and darkness. People on the boat were literally crying with disappointment. As we were reaching the dock to disembark, my son, Brandon, said, "Well, I had a good time, Dad." [Gratefully!] Thank you, Brandon, I am so glad to hear that!! 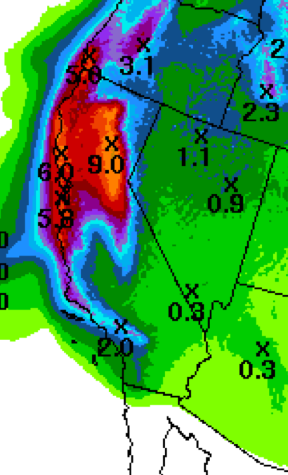 Generous rains being forecast for California with a number of spots forecast to have six inches or more. Below is the amount of rain (in addition to normal) needed to break the California drought and the various dry spells around the nation. From Mike Smith Enterprises, LLC. Mindy and I wish you and yours a great day of family and fun. The Greatest Thanksgiving Program Episode Ever! 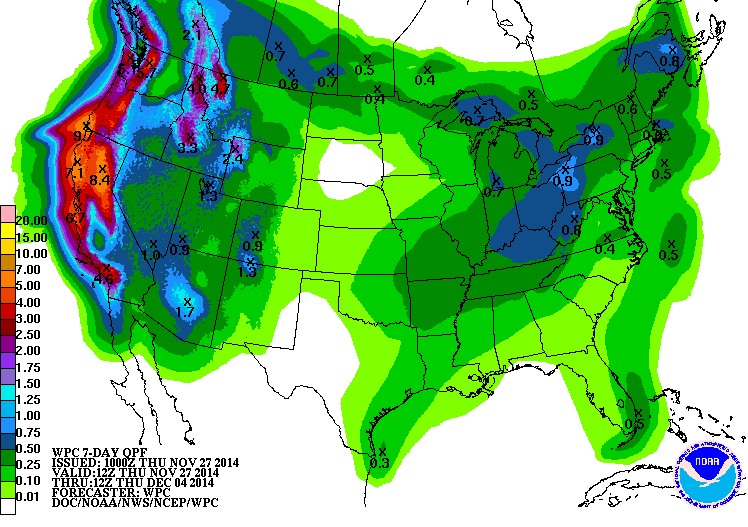 Here is an outlook of potential precipitation (snow in the Sierra, rain lower elevations) over the next two weeks. I believe the computer is underforecasting amounts over Donner Pass (between Colfax and Reno), so I have pulled the 7-9" in area into that region (see arrows). 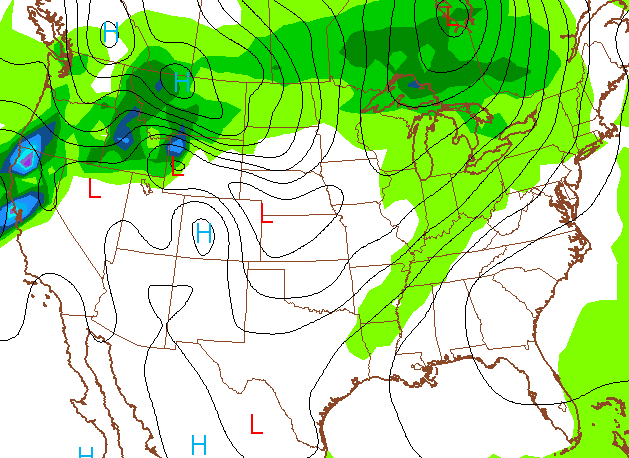 There is a pretty good chance a "Pineapple Express" may set up. If that occurs, some of these amounts may be too low but that is too soon to pin down. 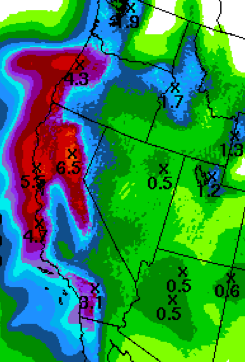 The rain will start near the Oregon border during the day Friday reaching San Francisco on Saturday. 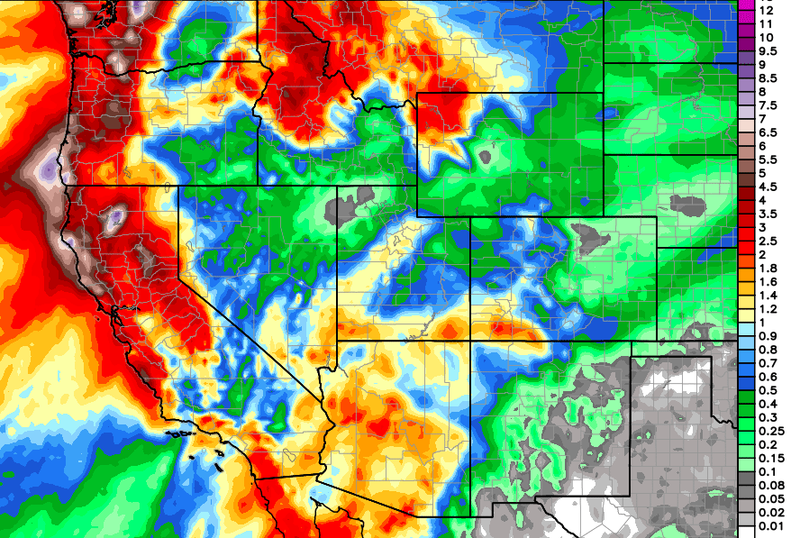 The generous rainfalls should extend south into the higher elevations of Los Angeles and Orange counties next week. If this forecast is correct, it will significantly dent the drought. 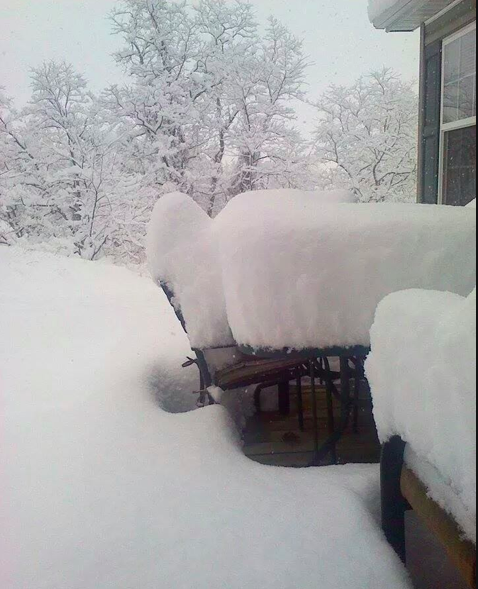 Extraordinary snowfalls being documented in West Virginia and other higher elevation locations. Boston, 1 hr. 13 min. Newark, 2 hr. 28 min. JFK, 1 hr. 19 min. LaGuardia, At least 2. 5 hours. Having problems with runway equipment. Philadelphia, 1 hr. 29 min. By 7pm, the snow should be over at Reagan Airport and ending at Dulles. 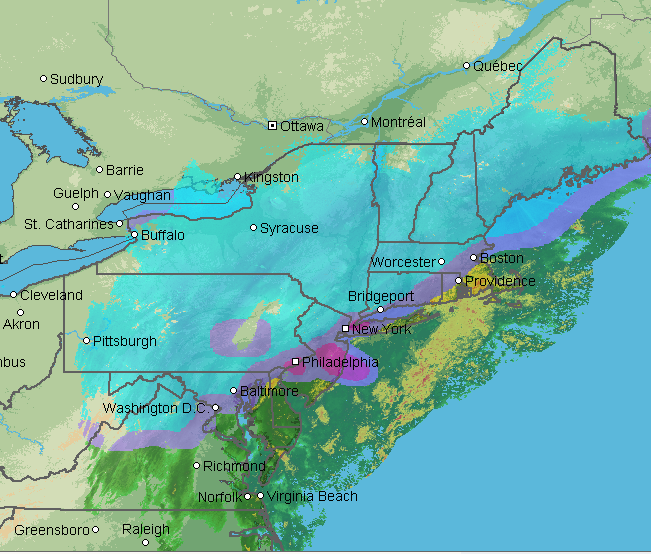 It will continue into the evening at other major Northeast airports. 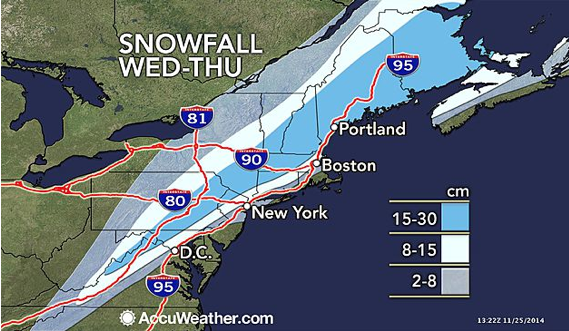 Note that NYC and Boston at that time will be a mix of sleet and rain if this forecast is correct. This will be the last travel update on this storm. Hope the coverage has been helpful in getting you to your family for Thanksgiving. 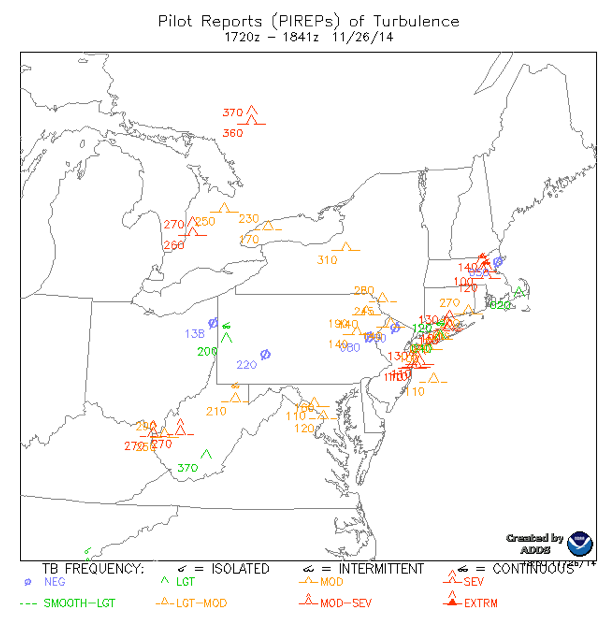 I won't try to decode this map for you, but it shows moderate to even severe turbulence from around Philadelphia across NYC and southern New England, including Boston. There is quite a bit of turbulence over the Appalachians, as well. If you are flying in these areas and are susceptible to air sickness, take your meds before you take off. Eat little. 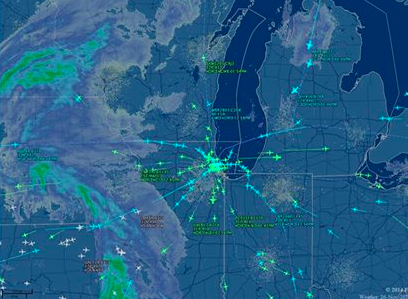 If you are flying through O'Hare later today or this evening, snow should not be a problem for airport operations. AccuWeather Enterprise Solutions provides precision forecasts to one of the most important airports in the world. Because every client is different, we insure our team knows how to provide exactly the information each client needs, when they need it. Below is a photo of our team at the O'Hare control tower. This is typical of the "field trips" we take each year. Weather science has become a vital tool for the transportation industry and for many enterprises large and small. If you think you business could be more profitable with better use of weather information, give us a call. Just click on the orange link above. 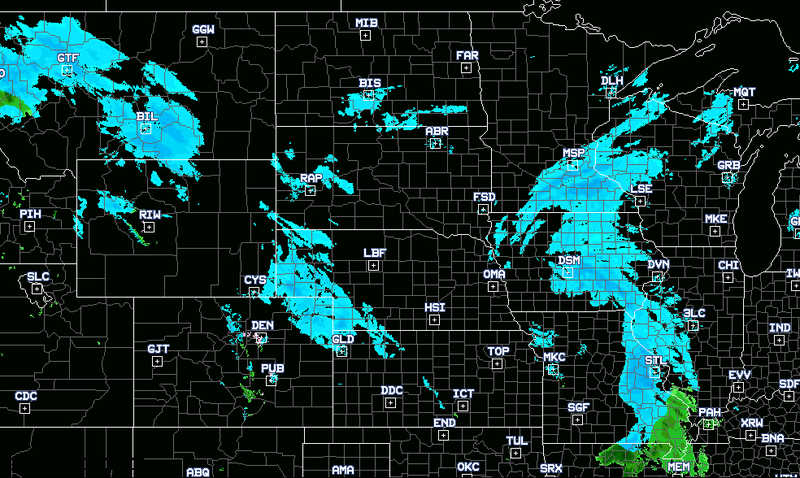 12:45 CST Update: Weather Science is Really Getting Good at This! 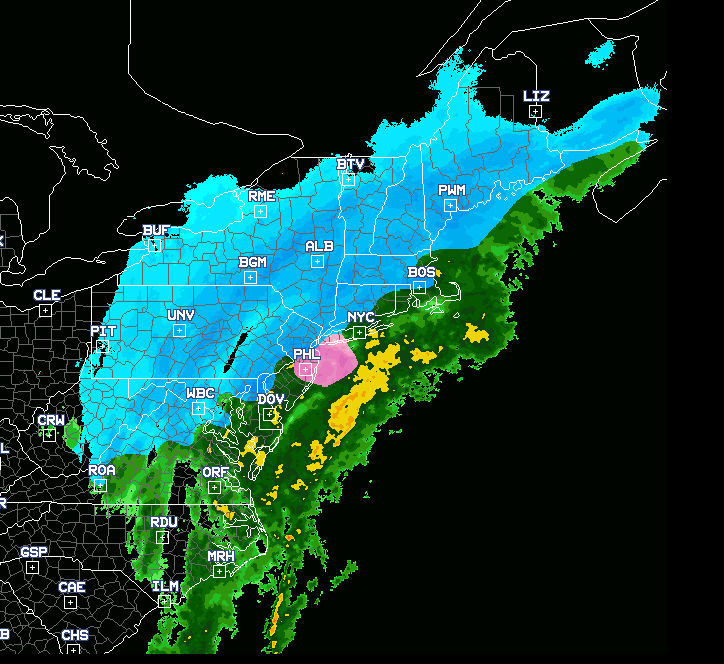 If you were reading this blog yesterday, you saw this forecast winterized radar for 1pm EST today. Pretty amazing, I'd say. 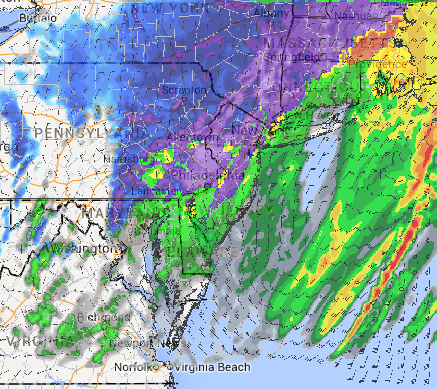 This blog, among many others, has been warning of today's snow storm since Saturday at 2:17pm… a full three days to adjust plans if you were so inclined. 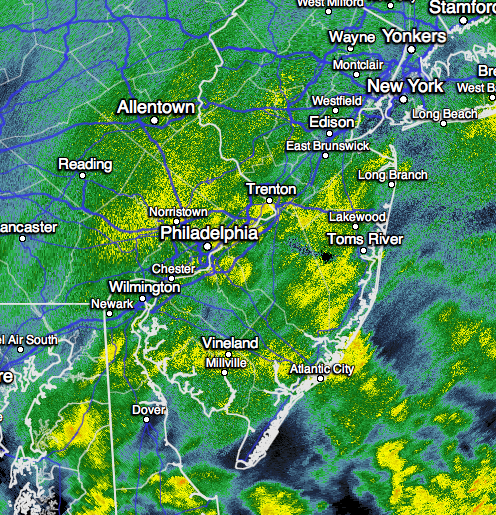 "Thundersnow" has been reported in Philadelphia and in several cities in Delaware. Lightning during a snow storm is just as dangerous as during the summer. Stay indoors! 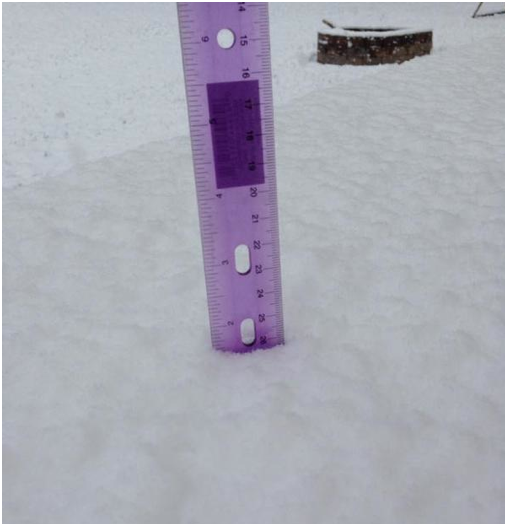 Current snow depth (via Twitter) in Sussex Co., NJ. Photo by "The Weatherboy." It is about an inch and a half. Just checked and all of the airports listed below still have major delays. 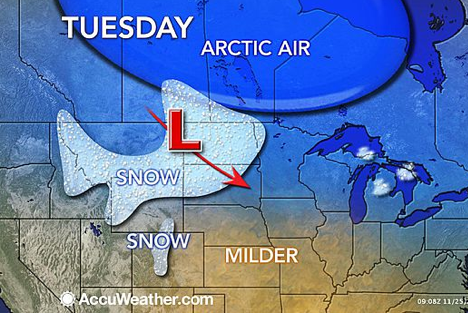 AccuWeather is providing complete coverage of the storm. From the "Capital Weather Gang" here are some current snow amounts. A snow emergency has been declared in northwest and north central Maryland. Their coverage is here. Just got an update, roads are "slushy" in Des Moines. The snow causing the delays in Minneapolis is visible. Newark 3 hr. 18 min. LaGuardia 3 hr. 9 min. Philadelphia 1 hr. 43 min. 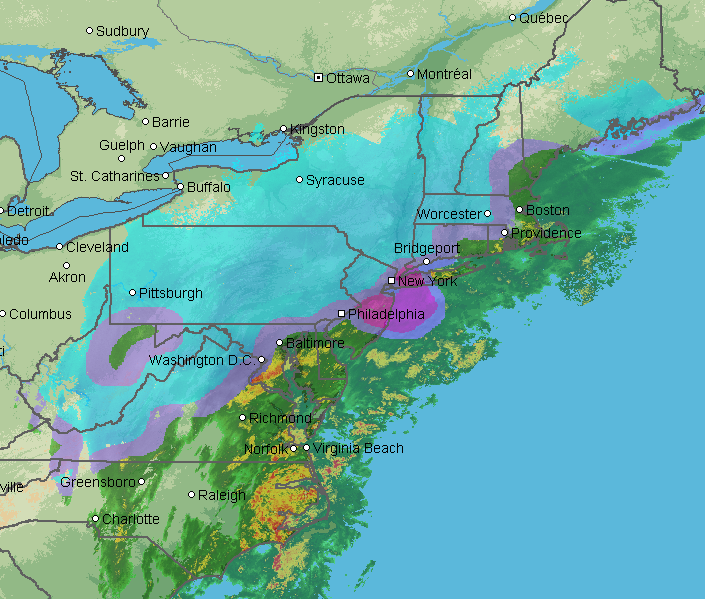 9am addition: USA Today reports 340 flights now cancelled. 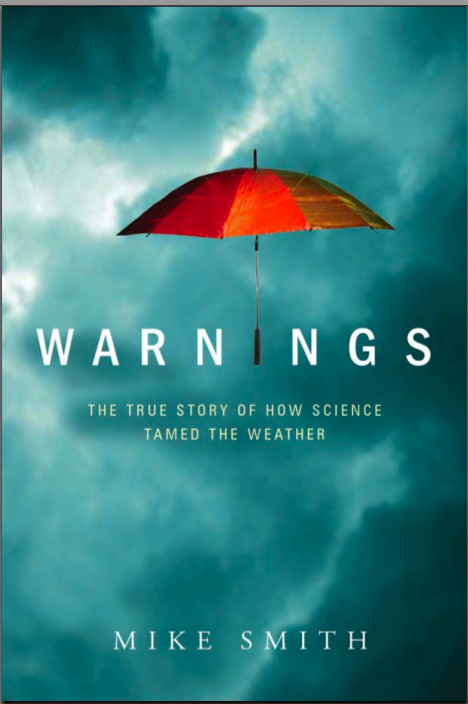 …the book that tells the deeply human story of how America's unique storm warning system was created and the people who created it. It is that storm warning system that is creating the forecasts you are seeing on this blog and elsewhere. If you enjoy this blog, you'll love Warnings! Here is the forecast radar for various times tomorrow. Blue shades are snow, darker = heavier. 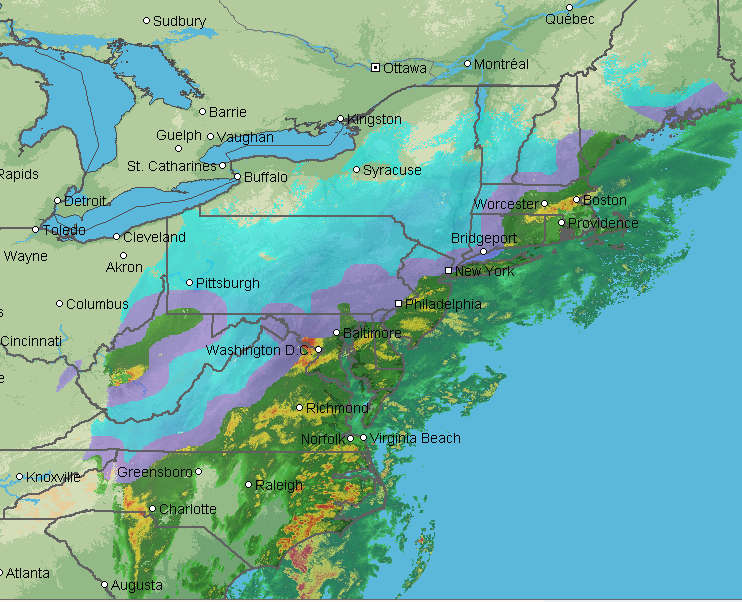 The small area of purple is sleet or mixed precipitation. NBC Nightly News had a story about the family that rebooked the trip from Boston to Phoenix and left a day early and a second family that headed down I-95 to Florida a day early. Smart people!! Good luck tomorrow. I'll have additional updates in the morning. 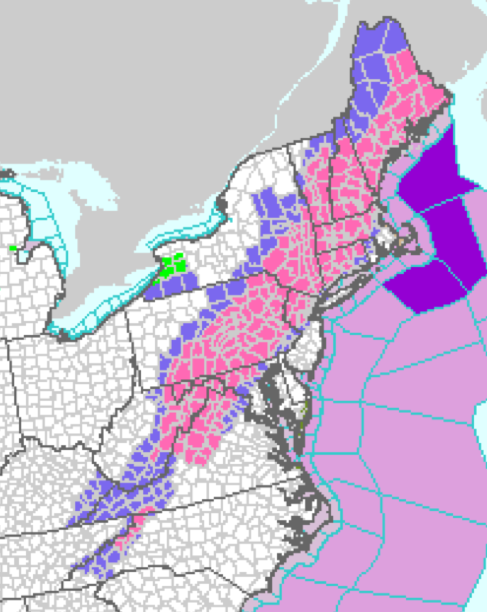 Pink is a winter storm warning. Blue is a winter weather advisory. Green is a flood advisory. The browns are various high wind warnings and high wind advisories. Check AccuWeather for specific local forecasts. Here is an overview of the storm total amount of snow expected. 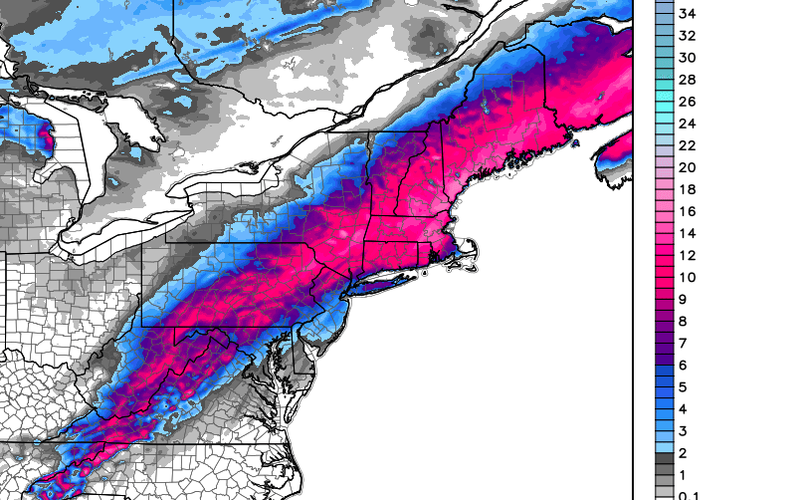 Note that amounts have gone up a bit in parts of New England. Here is the Boston-New York closeup. 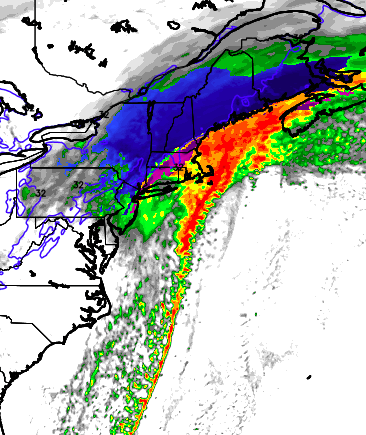 Note the extreme gradient between the coast (Logan Airport where 3-6" is expected) and areas farther inland and at higher elevations. Here is the Washington-Baltimore closeup. 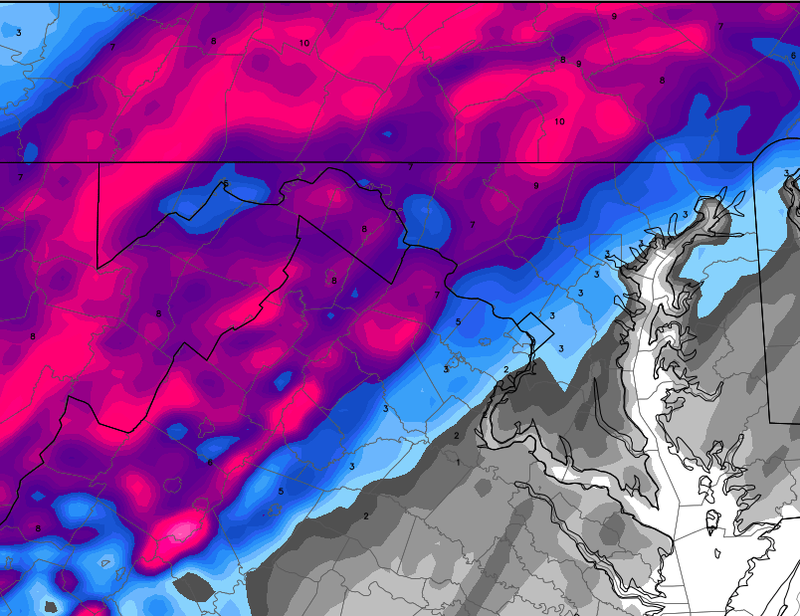 Reagan airport will have 2-4 inches with higher amounts at Dulles. Much farther south, these are the snowfall amounts expected to be on the ground at 9am EST Wednesday. I-40 will be a mess over the mountains. The storm will spread northeast during the day Wednesday. Again, my airline survival guide (free!) is here. If you can, take advantage of the waivers to beat the storm. UPDATE: 3:10PM. Here are the warnings issued by local NWS offices. 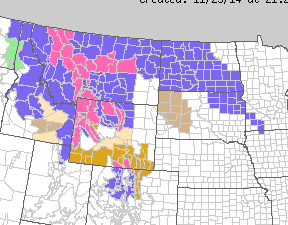 Pink is a winter storm warning. The bluish is a winter weather advisory (a lesser condition) for lighter amounts of accumulating snow. A rainy period will begin in far northern California on Saturday and will slowly spread south into the first of next week. This rain is desperately needed for the drought-weary state. Yes, it is possible there could be some travel issues late Sunday at SFO but it should not lead to widespread Thanksgiving travel issues. 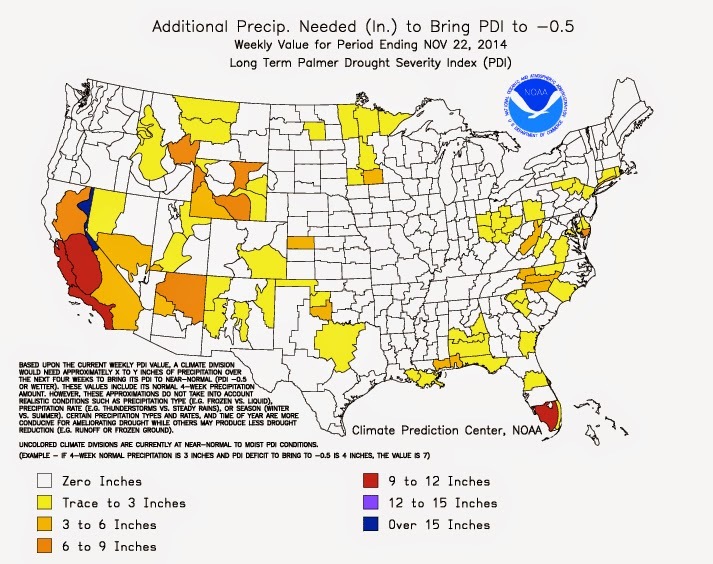 The map depicts ten-day precipitation and is courtesy of Dr. Ryan Maue. AccuWeather has a city-by-city summary and timing at the link. 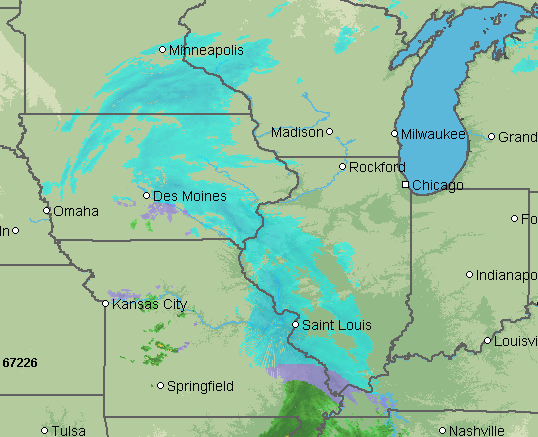 There is a second area of snow today that will move toward Chicago, causing flurries, tomorrow. 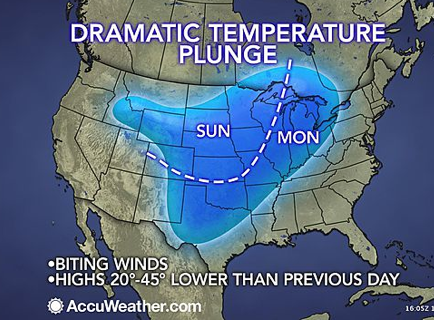 AccuWeather has that story here. 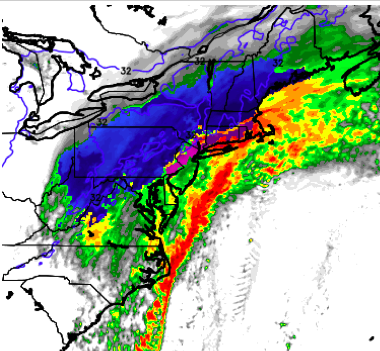 Another excellent article about New York Governor Cuomo's inaccurate and highly unfortunate criticism of the National Weather Service has been written. 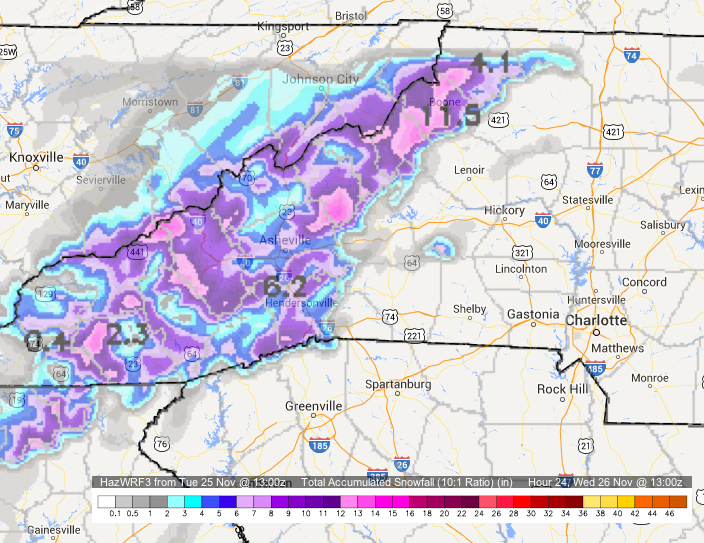 I'm running the article because what we are now forecasting -- pre-Thanksgiving snow as far south as North Carolina -- is also an unusual event and the article, hopefully, complements this blog's storm coverage. The article tells why the Buffalo blizzard forecast was so difficult, so amazingly good, and why Gov. Cuomo is so far off base. Gov. Cuomo telling New Yorkers the state didn't have tornadoes before global warming. President Obama told an audience "10,000 people died in the Greensburg tornado" when the actual death toll was 12 and the population of the town was 1,500. Vice President Biden said 161,000 were killed in the Joplin tornado. The actual death toll was 161 and the population was 50,000. Al Gore told an audience Hurricane Sandy was made worse by global warming even though the trend in Atlantic hurricane numbers and intensity is down. None of these were extemporaneous remarks (where errors would be understandable). In each case, they were delivering prepared comments. So, I believe it is reasonable to conclude these politicians and/or their speechwriters are so used to hearing about global warming-alleged catastrophes it doesn't even occur to them to question these ridiculous statements. Snow in Buffalo in November can't happen without global warming? I rest my case. If you were a resident of Baltimore and you received a forecast of snow accumulation between zero and sixteen inches you would laugh. 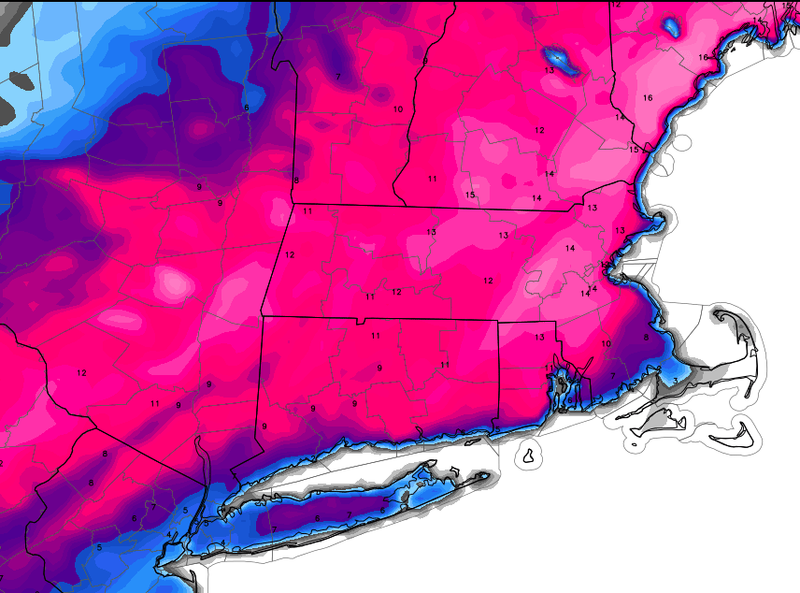 Yet, that is the range of the latest set of computer models with regard to Wednesday's forecast snow. Meteorologists use their experience and know-how narrow down the alternatives and make useful forecasts. BTW, AccuWeather is forecasting only a coating to an inch or so in downtown Baltimore. Mike Smith Speaker Evaluation? Outstanding! Is This a Great Christmas Gift, Or What? What Do I Do All Day?? Climate "Science" Has Become Climate "Justice"
U.S. Snow Cover -- Amazing! 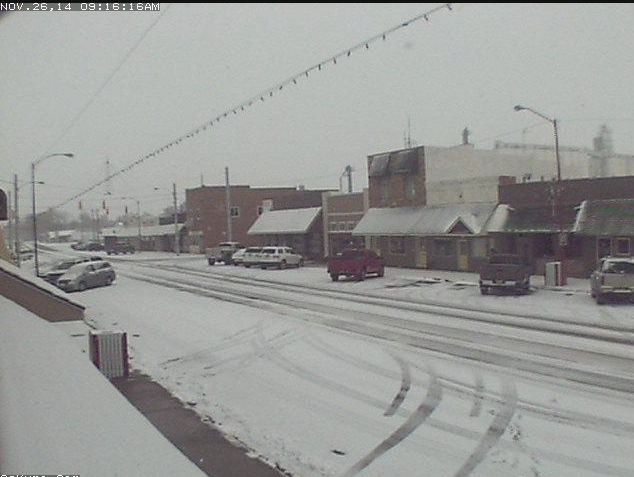 Snow on the Way for Many Areas!